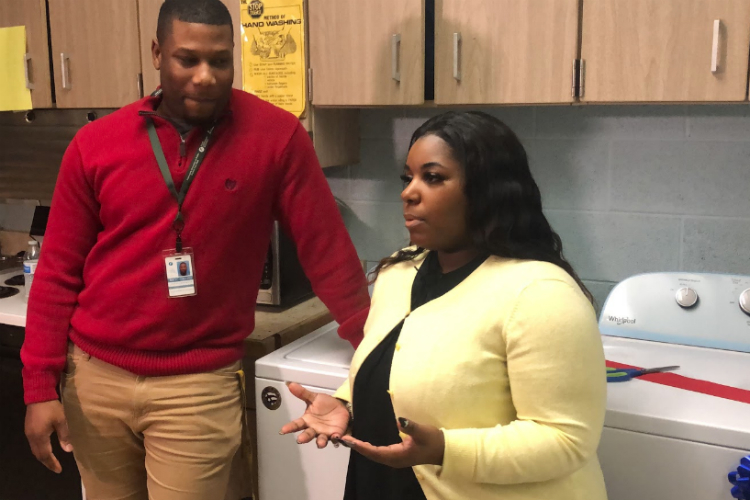 FLINT, Michigan — In a small back room near the entryway at Durant-Tuuri Mott Elementary school sits an unexpected gift intended to make school, and life, a little easier for Flint families. A volunteer at the school, Chia Morgan’s smile is as infectious as is her commitment to helping the Flint community. A social worker by trade, Morgan is program coordinator and treasurer for Well of Hope, a Flint nonprofit charity that made the gift using a donation from the Community Foundation of Greater Flint. Parents can sign up for times to use the washer and dryer — and spend time with their children. The washer and dryer can help build children’s self esteem and address issues that sometimes lead to bullying, Morgan said. Collins also notes that the washer and dryer could help open up other doors. Bringing parents into the school can also help engage them in other aspects of the school and their children’s education. Community School Director Chris Collins and Chia Morgan from Well of Hope talk about the importance of access to a washer and dryer for families.